Regardless of the strength of their democracies and institutions, the plunge in oil prices has tested the resolve of all Africa’s petro-states. Tapping Angola oil in Zaire province. Photograph by jbdodane. A decade of decadence has come to an end for African oil producers. International oil prices have fallen from last summer’s $100 per barrel highs, to averages of $56 in the first half of this year. After generating hundreds of billions of dollars in wealth over a commodities super-cycle, Africa’s big oil producers are facing economic crises and the threat of political instability. Even the continent’s new petro-states, some with relatively strong institutions and laws on transparency and accountability, are feeling the strain, well before their oil industries have really taken off. There are some winners from the international oil price rout. South Africa, Kenya and other major net importers on the continent, for instance, are benefiting from the fall in prices, with foreign oil typically making up a large share of their respective import bills. But there are also many losers. In Nigeria, Africa’s largest economy and top oil producer, economic growth has fallen by nearly two-thirds so far this year. Newly-elected president Muhammadu Buhari is seeking an over $2 billion loan from the World Bank to rebuild parts of the country torn apart by Boko Haram, an insurgency that might be helped in its recruitment efforts by the tumble in oil prices and associated economic struggles. In Angola, where petrodollars account for 70% of national income, the devaluation of the kwanza, the national currency, has crippled the spending power of consumers. The rising cost of food and fuel is stirring up resentment towards President Eduardo dos Santos, who has ruled Angola, one of the world’s most inequitable countries, for 36 years. Africa’s major oil producers are clearly feeling the impacts, but the economic fallout from lower oil prices is also affecting a new crop of African oil states. 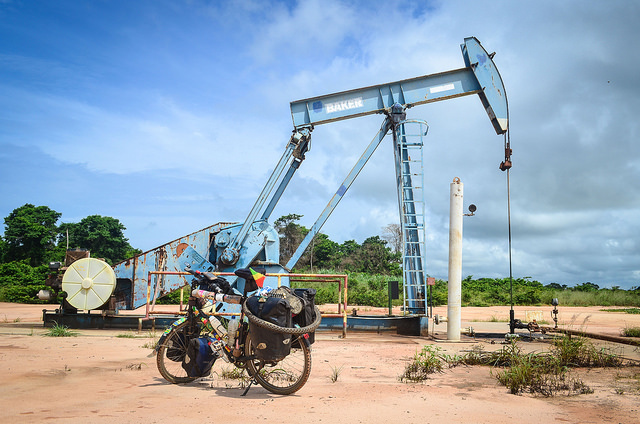 Enticed by opportunities to earn unprecedented windfalls when prices were still at their lofty heights, several oil prospectors entered Africa’s frontier markets, striking commercial deposits from Ghana to Uganda. While the International Energy Agency estimates that Africa holds only a tenth of the world’s crude oil, it is one of the fastest growing oil regions in the world, accounting for 30% of all new discoveries. And unlike the Middle East and Russia, Africa’s oil industries are open for business. Generous contractual terms and massive tracts of virgin territory lured in American and European oil majors, oil independents such as Britain’s Tullow Oil, and Chinese behemoths. In return, many African countries looked forward to the big rewards possible from even relatively small doses of oil. Although production has not yet started in Uganda, for example, the World Bank forecast that oil could generate annual revenues of over $2 billion at peak production with prices at $75 per barrel. Recognising that these incoming petrodollars would nearly double government revenues, the Ugandan government borrowed heavily against its future oil earnings. In the last few years, Uganda has amassed billions in loans from deals with Chinese state banks and other lenders to fund ambitious hydropower and other infrastructure projects. Uganda’s debt is now one-third of its total GDP. However, the country is now becoming acutely aware that if oil prices remain at current levels of below $50 per barrel, earnings will be much less than anticipated and will need to finance a growing debt burden. The oil bonanza may be over before it’s started. Critics warn that Uganda may be following the perilous path of previous African oil producers, where resources have undermined development, rather than powered it. The discovery of Ugandan oil in 2006 coincided with President Yoweri Museveni’s deeper centralisation of power and patronage. Uganda has rejected the idea of taking part in the Extractive Industries Transparency Initiative and kept oil contracts out of the public eye. Instead, the president has micro-managed oil and other major sectors of the economy. Political opponents, civil society, and even voices from within the ruling National Resistance Movement have urged him to taper back the spending, but Museveni has responded by further tightening political space in the country. The impact of Uganda’s oil discoveries looks highly uncertain. Towards the other end of the spectrum in terms of transparency and strength of institutions is Ghana. In contrast to Uganda, Ghana’s relatively strong democratic credentials are argued to have given the country “structural immunity” against the negative outcomes of oil for development. The country has held six successful elections since 1992, two of which have seen a transfer of power to the opposition, and Ghana was the only country in sub-Saharan Africa to meet the 2015 Millennium Development Goal of halving extreme poverty. Furthermore, when the Jubilee oilfield was found 60 km off its coastline in 2007, Ghana passed impressive legislation governing oil revenue transparency and gave room for civil society to monitor government expenditures and follow up on environmental impact assessments. Yet despite these provisions, Ghana was reeling from high debt levels even before the dramatic fall in international oil prices began. Despite its ranking as Africa’s leader in quality of governance in extractive sectors, soon after striking oil, Ghana began to borrow beyond its means to invest in infrastructure and raise civil servant salaries. Ghana’s debt is currently 60% of its GDP, nearly double that of Uganda’s burden. Furthermore, the government recently put a cap on the oil revenue stabilisation fund, an account specifically designed to offset oil price volatility. And it may also amend other aspects of its widely praised Petroleum Management Revenue Act to access more revenue in these difficult times. Protest from Ghana’s strong civil society and active political opposition may yet help to moderate the use of its oil wealth and may mean it is better placed to negotiate the storm responsibly than others. But to date, it seems that the good governance model of establishing a sound institutional and legal setting to manage oil revenues is not necessarily performing better than more opaque systems elsewhere on the continent. Regardless of the vibrancy or erosion of their democracies, the plunge in international oil prices has tested the resolve of all Africa’s petro-states. Luke Patey is author of The New Kings of Crude: China, India, and the Global Struggle for Oil in Sudan and South Sudan and senior researcher at the Danish Institute for International Studies. Follow him on twitter @LukePatey. Luke Patey is senior researcher at the Danish Institute for International Studies, lead senior research fellow at the Oxford Institute for Energy Studies, University of Oxford, and author of The New Kings of Crude: China, India, and the global struggle for oil in Sudan and South Sudan (Hurst, 2014). Follow him on Twitter at @lukepatey. Popular resistance to the Burkina Faso coup: who, where and what next?